The Single Run workflow step is used to select the Flow and Transport Engines you wish to include in the model run. Visual MODFLOW Flex requires you to select a flow engine for a particular run. Running a transport engine, a particle track engine, and/or ZONEBUDGE is typically optional. The flow and transport engine(s) available for selection are based on the flow and transport options chosen at the the Define Modeling Objectives workflow step as well as the selected grid type. 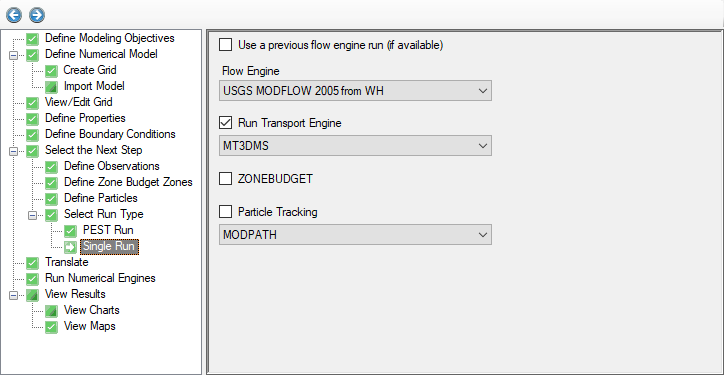 For example, parent/child grids used with MODFLOW-LGR flow models are not currently compatible with any of the transport engines, ZONEBUDGET, MODPATH, or MOD-PATH3DU. However, model results from an LGR run can be extracted to a standard finite difference subgrid and subsequently run with transport, ZONEBUDGET, MODPATH, or MOD-PATH3DU. The table below lists all supported engines and utilities supported in Visual MODFLOW Flex. For more information on which flow and transport engines are compatible with the supported modeling objectives, see the respective sections on Flow and Transport modeling objectives. •MODFLOW-LGR should only be run when you have defined a child grid and ran Conceptual to Numerical Conversion from the Conceptual Modeling workflow. •MT3DMS and MODPATH are not supported by MODFLOW-LGR. •MODFLOW-SURFACT and SEAWAT are coupled flow and transport models and are not supported with MT3DMS or RT3D. When you are finished, click (Next Step) button to proceed.